For a quarter century Gary Richards, aka Mr. Roadshow, has informed and entertained readers of The Mercury News about the challenges of moving around in the nation’s fifth largest metropolis. On Saturday August 20th, 2016, his readers had the chance to see him, as well as a cadre of experts from public agencies and private companies discuss the present and future of transportation on a panel at the 1st Annual Transportation Forum. In the above interview, he provides a few of this thoughts on this morning-long event at Archbishop Mitty High School. In addition to the panel, the event included presentation of the D1 Mobility Challenge Award, presentations by Shireen Santosham, Chief Innovation Officer, Office of Mayor Sam Liccardo, City of San Jose and Sarah Syed, Principal and Founder of Sage Vista and opening comments from the event’s sponsors, Councilmember Chappie Jones and State Senator Jim Beall. There were a number of table top displays with everything from parking lot inventory technology (TransForm) to PodCars (CyberTran). With a glimpse of how interactions between local government and its citizens can become much more responsive and far-reaching, the event featured a text message-based polling system that allowed the 200+ audience to answer questions and give instant mini-survey results. Granted, the results from the polling were probably skewed in that they were biased towards an audience that had a keen interest in transportation and had a demographic that didn’t necessarily reflect the broader community. Still, the results hint at what can be done with new approaches, such as what was advocated by Syed, as she described Owlize, which uses virtual reality technology to provide anyone a 24 hour a day opportunity to give feedback on a proposed development using either a smart phone or a viewing kiosk that is reminiscent of the public binoculars often found at airports or national monuments. Reflecting Ford’s announcement that it will have Level 4 (no driver intervention – no steering wheel, no brake or gas pedals) autonomous vehicles on the road by 2021 and Uber’s announcement that it will start giving rides in Pittsburg via autonomously driven vehicles within the next two weeks, a full 75% of the audience who responded believes we will see autonomous vehicles on the roads of West San Jose within 10 years; 33% of the audience who responded were even more aggressive in their predictions believing it would be within 5 years. Another surprising poll result, for such a car-centric area, was that 64% of those who responded believe that decision-makers should address transportation issues by making transit, biking and walking more viable options. Finally, with 74% saying, if they had to vote at that moment, they would approve the 1/2 cent, 30 year VTA tax, the audience fairly closely mirrored the Silicon Valley Leadership polls. 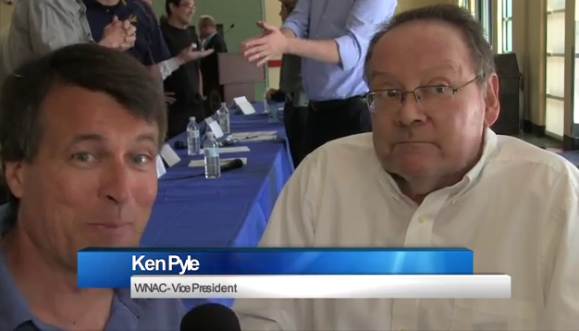 Stay tuned for more videos from this event, as well as future presentations at WNAC meetings, where we continue to explore the rapidly changing intersection of land-use and transportation.